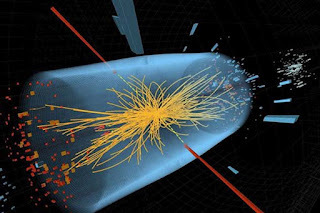 Some quiet thoughts : Reflections: In Him we move and have our God particle! In Him we move and have our God particle! The headlines in this morning’s paper is about the great discovery of what has been nicknamed the “God particle”. All I can do is shake my head and bemoan the fact that man has truly lost his way. I am reminded of Romans Chapter 1 The wrath of God is being revealed from heaven against all the godlessness and wickedness of people, who suppress the truth by their wickedness, 19 since what may be known about God is plain to them, because God has made it plain to them. 20 For since the creation of the world God’s invisible qualities—his eternal power and divine nature—have been clearly seen, being understood from what has been made, so that people are without excuse. What has taken 50 years and billions of dollars to find ( something that they are not even sure of); thousands of years ago all it took the God Almighty was to say, “Let there be…” and BANG! There it was, all of creation in all its splendor, variety, and magnificence. God did not just create one particle, HE created the entire universe, entire galaxies. Why don’t we just get it – HE is God the uncreated one who created all things just by HIS word and no matter how intelligent mankind is, we are still finite in our thinking, our ability to grasp and understand certain things. When we conspire to bring God down we put ourselves in a dangerous place and you know what? He who sits in heaven laughs while we plot and study and research in vain ( Ps 2 :1-3). The reason we don’t get it, is outlined in Romans Chapter 1 – our thinking becomes dark and we can no longer see, that “in Him we move “ ( Acts 17:28) and have our God particle! I have found my God particle - have you?